16 December 2016, 12:00 AM. Hey, folks. I know it hasn’t been that long since my last reading recommendation, but I wanted to get another one out before I get bogged down with real life stuff. What real life stuff? Well, as of last Friday, December 9, I’ve officially finished grad school – I am now the proud recipient of a Master’s degree in Library & Information Science. It’s been a crazy trip, and honestly, part of me is surprised at how quickly it seems to have ended. But that also means I need to focus on the job hunt – I have a nice, shiny degree, and now it’s time to put that to use. But enough about me – we’re here to talk about awesome books. And today, I want to tell you about a really awesome fantasy novel, the first of Patrick Weekes’s Rogues of the Republic series, The Palace Job. It would help if she wasn’t in jail. The plan: to steal a priceless elven manuscript that once belonged to her family, but now is in the hands of the most powerful man in the Republic. To do so Loch—former soldier, former prisoner, current fugitive—must assemble a crack team of magical misfits that includes a cynical illusionist, a shapeshifting unicorn, a repentant death priestess, a talking magical warhammer, and a lad with seemingly no skills to help her break into the floating fortress of Heaven’s Spire and the vault that holds her family’s treasure—all while eluding the unrelenting pursuit of Justicar Pyvic, whose only mission is to see the law upheld. 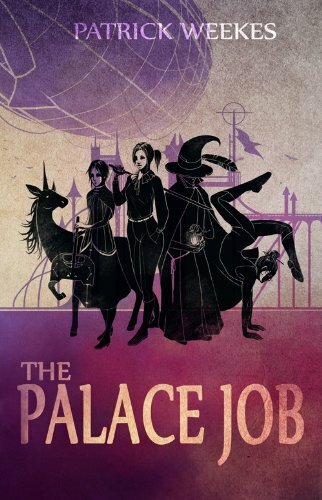 The Palace Job is a funny, action-packed, high-fantasy heist caper in the tradition of Scott Lynch’s Gentleman Bastards series, from debut author Patrick Weekes. Honestly, I can’t really do better to sell this book than that. This book is a fantasy ensemble heist caper – it’s Ocean’s Eleven by way of Dungeons & Dragons. If that doesn’t get your attention, I don’t know what will. The action is good, the humor is great, the twists are sudden and surprising (but entirely in keeping with the heist set up). The characters are solid and interesting, with each given plenty of time to demonstrate their skills – an essential part of any ensemble piece. But also, the author should be a recommendation. Let me answer that question with another – have you heard of a little franchise called Dragon Age? Weekes did a good bit of writing for the franchise. He’s the author of The Masked Empire, the first tie-in novel not written by the franchise’s lead writer, David Gaider, as well as writing for Dragon Age: Inquisition – he wrote Solas, Iron Bull, Krem and the other Chargers, and Cole, as well as the quest Here Lies the Abyss (the one about the Grey Wardens, that ends with you fighting a giant spider fear demon in the Fade), and was lead writer for the Trespasser DLC. Also, as of March 2015, Weekes took over as lead writer for the franchise from Gaider. Personally, I see all of that as a pretty impressive resume. Makes you wonder what he can do when he isn’t restrained by an established setting owned by a third party, no? Oh, and one more thing: there are currently two other books in the Rogues of the Republic series, both sequels to this book. Right now, this book is available for US$1.99 for Kindle. The second is the same price. The third is a bit more expensive, at US$3.99. But do the math. In total, that’s three books for a little under US$8, about what you’d expect to pay for a typical mass-market paperback. If that bargain doesn’t convince you to at least grab the first book, then there’s no hope for you, and I have to assume that you hate fun. Buy this book. Seriously, do it. Oh good a fantasy heist. One of the things that threw me off of high fantasy in the past is how uniform it was. Yeah, there were different stories that were enjoyable, but for the most part it was mostly quest fiction about defeating a big bad. Since I’ve gotten over it (and, y’know, found a lot more diverse books), but it’s still nice to see something break the mold. And heists are always fun. Well, there is a big bad that gets defeated, but that only crops up towards the end. But I think the best part is how well the ensemble aspect is pulled off – every character has a part to play, and their own arc (if only a small one). It’d be so easy to ignore most of the cast in favor of the main character, but that doesn’t happen. And I’m fully alright with that! I like having a villain and all; mostly I think that too many books are a bit too straightforward in their approach to it, and from what you’ve said this one doesn’t. An ensemble is always good—too many authors have an ensemble and then only focus on one or two of the characters, and the rest kind of get the short end of the stick. So good on Weekes for being above that!